Paradise 9 is a UK based psychedelic rock band. This is a self produced and released CD. It begins with a long acoustic, melodic love song. The band is lead by Gregg McKella, who does the lead vocals, guitar, effects, clarinet, and keyboards. He is backed up by Andy McDonald on bass and Wayne Collyer on bass. They also have a number of guests. The next track, Into the Ethers is where the CD really takes off though. A long spacey delay guitar intro and a nice bass line lead us off into the Ether, a basically instrumental track. All Said and Done is another cool song with mostly acoustic guitar and some fiddle and backing female vocal tracks like the first track. 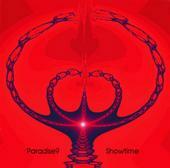 The title track, Showtime has really excellent lyrics and a fun acoustic driven track. Glow is a slow melodic melancholy track but gets nice and spacey at the end and I like the way it progresses. Great track. 700 Feet is a dark track but has a great mood and feel. These Days brings the real psychedelic rock back to the record with some cool guitar and vocals as well and a great bass line that just carries you along. Theme is another really nice spacey instrumental with some really flying spacey guitar. The CD ends with A reprise of These days. A pretty cool and impressive release. I can’t wait to hear more by this band and the new heavier psychedelic stuff.